A little cloud here, some premises there -- contact centers no longer need to make an either/or decision. It's been a long time coming, but in the world of communications we're beyond the point of "cloud or no cloud." In this regard, the deployment decision is no longer an either/or proposition. "There's growing acknowledgement that we can mix and match the best elements of public and private clouds," McGee-Smith said. With that acknowledgement comes a shift in the decision-making mindset. Not so long ago enterprises made the private cloud vs. public cloud decision for applications in whole. But that's changing, McGee-Smith said. "Today I think the growing notion of hybrid means I can have a mixed environment within an application." As an example, she added, "I can have a contact center application where 80% of that is premises-based, but there are elements that I choose to deploy in the cloud." Interactive, which straddles the premises and cloud worlds, sees this sort of mash-up taking place in the contact center, agreed Brian Spraetz, solutions marketing manager at Interactive and webinar co-presenter. One hybrid scenario that Interactive runs into quite a bit, he said, is the local call control model depicted below. 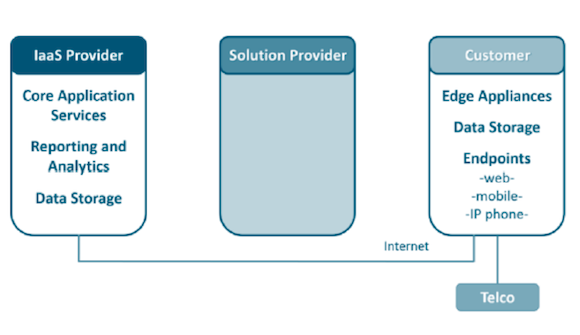 In this model, a company uses a public cloud for the application layer -- for delivery of the contact center application services, reporting and analytics, and data storage. But all of the call processing takes place at the customer site, Spraetz described. This hybrid setup has become popular because it gives companies an additional level of control over the customer interaction, he said. "So, you could set this model up so that if there are recordings they never leave the site. You can set it up so the actual voice traffic itself never goes into the cloud." Cost savings apply, too, Spraetz added. "If you're not sending voice traffic back and forth between [your premises and] the cloud, then you don't need quite as big a pipe." Another hybrid model involves the mixing of private and public cloud services from different suppliers. "This is fairly new, but there are companies that are coming out with public services that can be integrated with existing on-premises and other cloud solutions," Spraetz said. "So, from a hybrid point of view, now there's a mixing of all these different models into a single cloud ecosystem, if you will." The resulting cloud ecosystem can get "pretty complicated pretty quickly," he added, "but it is something that we're seeing start to evolve today -- particularly the ability to mix premises equipment and cloud equipment, even if not from the same provider, into a more cohesive solution." While complexity is a con, to be sure, hybrid does come with its pros, McGee-Smith said. "The pro I think of most on hybrid is the ability to continue to use premises-based solutions that may not be at end of life -- to be able to sweat those out but at the same time get some value from new innovation." Besides the hybrid model, McGee-Smith and Spraetz shared overviews of private, single tenant, and multitenant cloud architectures. But interest among attendees seemed directed toward hybrid, with 44% of webinar quick poll respondents saying that model "most resonated with the needs and values" of their organizations. Hybrid cloud use for contact centers will be the trend to watch, McGee-Smith concluded. "We'll see a lot more of this happening in the near future as options for public cloud services increase and people decide they want a little bit of this and a little bit of that and, 'Can you make it all work together for me?'" In addition to the hybrid model, the webinar covers private, single tenant, traditional multitenant, and distributed multitenant cloud architectures. Download an executive summary, or view the webinar on demand.